Thick & Chewy Bakery Style Double Peanut Butter Cookies with the perfect gooey center will be the only peanut butter cookie recipe you will ever need! It’s guaranteed to be a crowd-please among your family and friends. I really honestly can’t remember the last time I had a peanut butter cookie as good as these double peanut butter cookies. 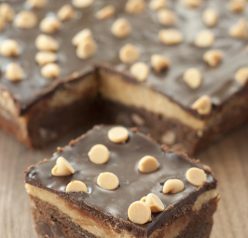 It is rare to get the taste and texture just so perfect, but this recipe truly has it all. 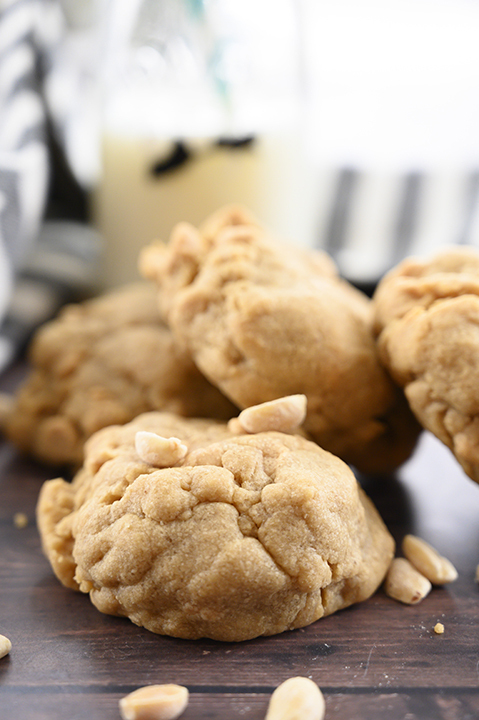 If there’s a hall of fame for the peanut butter cookie, these make it in hands down. 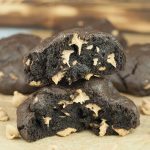 They remind of me of Thick, Chewy Chocolate Chip Peanut Butter Cookies or my Peanut Butter Chocolate Soft & Chewy Crinkle Cookies, but made with ALL peanut butter and nothing BUT peanut butter. These double peanut butter cookies bake up nice and thick. 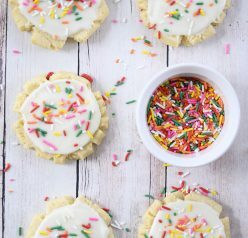 They hardly spread at all in the oven so you actually have to press down the cookie mounds a bit with the palm of your hand before baking them. They turn out just like peanut butter cookies you would get at a bakery, except way better. The addition of peanut butter chips to the cookie dough is pure genius. They add extra peanut butter flavor while also scoring extra texture points with each bite. These cookies stay slightly gooey (in the best way possible) on the inside and you will fall head over heels for them. I made these double peanut butter cookies the other day when I was craving anything and everything with peanut butter. I rarely tell myself “no” to my food cravings. I deserve it, right? Right. I guess I got into the bad habit of justifying all of my cravings while I was pregnant and kind of just cling to it. In reality, cookies are a life-saver for me. I can grab one and eat it with one hand while I’m walking around with the baby. If I can’t eat it with one hand, it cannot be eaten at all. Or it will sit there on the counter all day long until I get around to finally eating it….ice cold. I make my favorite Chocolate Chip Oatmeal Cookies almost once a week! She’s kind of going through an “all I want is mommy” separation anxiety phase. I read in my baby wonder weeks app (what did people do before smart phones and apps?) that this is totally normal for her age. I love it at times, other times it’s very inconvenient to not be able to get a break. For now, I am soaking up all the baby snuggles and eating all the cookies. Thick & Chewy Bakery Style Double Peanut Butter Cookies with the perfect gooey center will be the only peanut butter cookie recipe you will ever need! It's guaranteed to be a crowd-please among your family and friends. Plan ahead because the dough requires chilling! In the bowl of a stand mixer or using a hand mixer fitted with the paddle attachment, cream butter, peanut butter, and both sugars together for about 3 minutes. Add in the egg, vanilla, milk, baking soda, and salt and mix until combined. Add in flour, one cup at a time, mixing until just combined (don't over-mix). Stir in Reese’s Peanut Butter Chips until well distributed. Scoop ¼ cupfuls of chilled dough and place on a cookie sheet. Cover tightly and chill your dough for 4-5 hours or overnight (overnight is best). Place cookie dough balls on cookie sheets lined with silicone baking mat or parchment paper. Flatten the cookies slightly with the palm of your hand because they don't spread much while baking. Bake 11-13 minutes or to your liking. Mine were done at 13 because they were large. Cool on baking sheet for 5 minutes before transferring to wire rack. They are great warm! 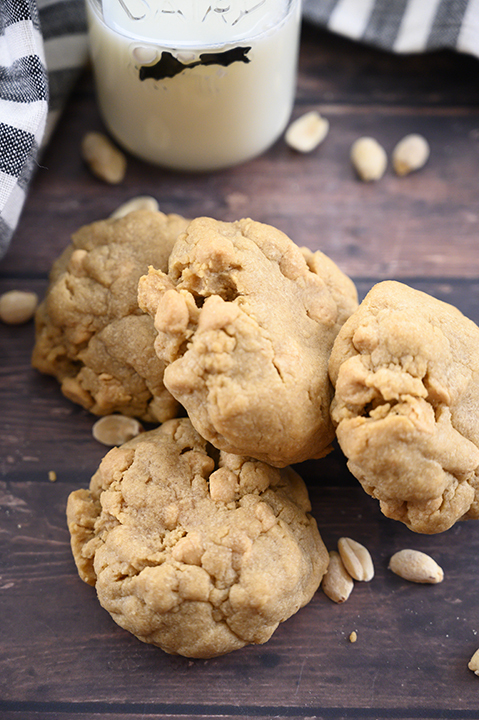 I love a good soft, gooey peanut butter cookie! These sound amazing!!! Do I bring these to room temp before baking or put them in oven cold? Thx. Putting them in chilled is fine! I have a peanut butter cookie craving, too! Glad this only makes a dozen as I could eat them all myself!!! I loved it! They are so easy to make and really delicious! YES-the more peanut butter the better! And I love how chewy they are!!! I made these Sunday and the whole family loved them! Thanks for the delicious recipe! I hadn’t made peanut butter cookies in years, and so glad I tried this recipe! Perfection!! These were really amazing! My kids enjoyed every piece! The PB chips in this are essential. So much peanut butter flavor! I always eat an unhealthy amount of these when I make them. These are seriously the best peanut butter cookies!